To make a booking please select a date range from the calendar any availability will then be shown for each property, for more details and accommodation galleries please visit our ACCOMMODATION INFORMATION where you can also check individual accommodation availability, secure online checkout. If you prefer and you have checked availability you can also give us a call on 01654 712712 to make your booking. The View Aberdovey a Visit Wales 4* family friendly holiday property with its own roof top terrace. Situated on the main seafront of Aberdovey, offering uninterrupted views of the Dyfi Estuary and beyond. Overlooking Aberdovey / Aberdyfi beach, a natural area with clean soft golden sands, perfect for a family holiday by the sea. Roof top terrace and a bay window…what’s not to like? 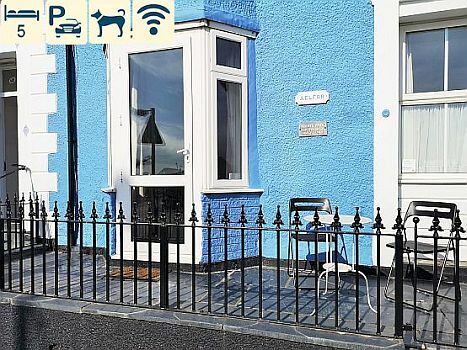 Visit Wales 4* First Floor Sea View holiday home set on the main seafront of Aberdovey. Beachcomber Aberdovey has been carefully furnished to provide guests with a high standard of holiday accommodation. A real home from home where guests can enjoy a truly relaxing holiday, surrounded by the beautiful Snowdonia National Park in the village of Aberdyfi. Visit Wales 4* Aberdovey sea front self catering holiday home. A romantic escape for two or a family friendly property, ideal for small families looking for reasonably priced quality holiday accommodation, in a central village location, with superb views overlooking the sea and the natural golden sandy beach of Aberdovey. AVAILABILITY FROM 23RD – 29TH APRIL, 24TH MAY…. Visit Wales 4* Second Floor Sea View holiday home on the main seafront of Aberdovey. Sit and relax in the bay window and enjoy fabulous views of Aberdovey beach, the Dyfi Estuary and beyond. Spinnaker is ideal for couples seeking a high standard standard of accommodation or for small families looking for a holiday by the sea.